Texas is expanding with high paying jobs and leading America in entrepreneurship while California continues its nosedive. Texas, depending upon less taxes, common-sense regulation and encouragement of entrepreneurship, has grown whereas California is falling further behind with bankruptcy just around the corner. Here is the kicker, California could be as wealthy as Texas and be able to raise enough revenues to wet the appetite of any California politicians. Like Texas, California is awash with resources including energy. California was one of the top three energy producers, but now the small state of North Dakota has surpassed California and the reason is not geological but policy. In the case of California, bad policy has restricted California's access to needed energy. Texas has doubled its output over the past decade and out produces the next four states in line, including California. Texas Railroad commissioner Barry Smitherman believes that Texas could even triple that production a decade from now. This could help make the United States energy independent, and this has led to a growth in jobs throughout Texas. While Texas energy production is up on a monthly basis, California production is dropping on a monthly basis. More than 400,000 Texans have jobs in the oil and gas industry with the average salary being 100,000 dollars a year in a state where the cost of living is significantly less than the former Golden State. The energy industry provides 80 billion dollars a year for the Texas state economy. California's production has dropped 21% since the beginning of this century, and it is not due to California running out of oil or gas but because California politicians and environmentalists have made it difficult to develop these sources of energy and jobs. For every 10 Texans employed in an industry that averages 100,000 dollars a year, only one Californian is employed. 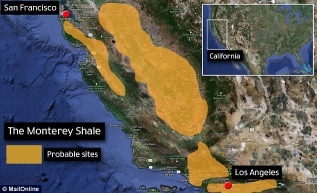 California has plenty of reservoirs offshore and in the Monterey shale that stretches 200 miles south of San Francisco and doubles the reserves located in North Dakota. So far, a federal judge has blocked the use of fracking, the breakthrough drilling process in California, despite the process being safely regulated in other states. Much of Texas oil production is on private land where owners are willing to lease at price, whereas California's oil wealth is on state or federally owned land. The average time to get approval for oil rigs in Texas is four days whereas in California, it can take months. The difference between Texas is that Texans loves their energy industry and the high paying jobs that go with them. In California, it is not cool to love energy development unless it is green and some political fundraiser can collect money from government subsidies. Texas government collects 12 billion dollars in tax revenues, and the average Texan doesn’t pay income tax. California pays as much as 13.3% in income and capital tax rates, something that could easily be reduced if California chose to increase oil and gas production. California politicians and many of those wealthy green lovers who finance the Democratic Party are selfish for they are willing to indulge in some feel good environmentalism while the average Californian sees their roads and schools crumbled and are denied high paying jobs. It would be good for America if California imitated Texas. And it would be even nicer if California politicians would be less of ideologues and less selfish, so California can truly develop all of its resources!